Situated in the North Wessex Downs Area of Outstanding Natural Beauty (AONB), the proposed site is near a ‘worked out’ quarry situated near the Chieveley motorway services south of the M4 motorway. Due to the sensitivity of the site, curved roof forms have been chosen to soften the silhouette and general outline of the building. This introduces aesthetically pleasing shapes far removed from more conventional industrial buildings and factories. The facility comprises three separate structures which abut a circular “drum” from which rises the multiflued stack. 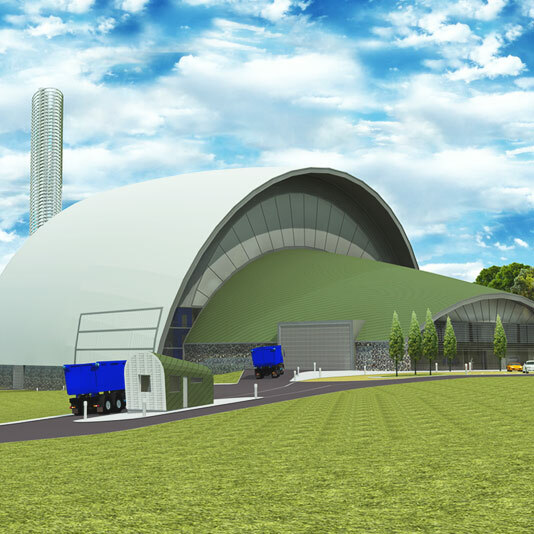 The larger element is a twin stream incineration process capable of processing 350,000T of waste PA, a tipping hall and boiler linked to an extensive gas clean up system. 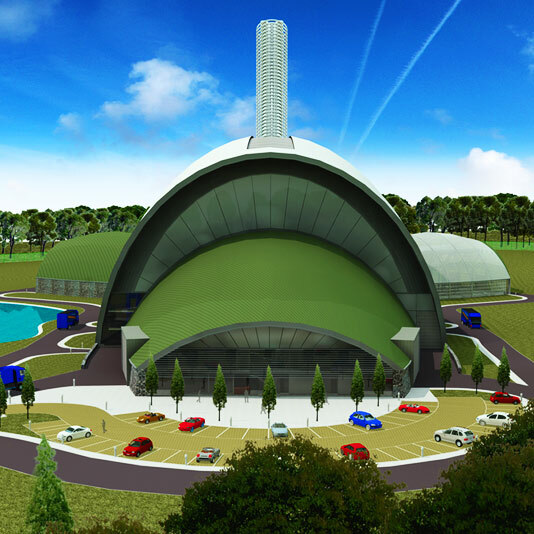 The two smaller elements house an advanced Plasma Treatment Plant which is powered by electricity generated by the main plant and air cooled condensers. This facility will generate 25Mw of electricity to be fed in to the national grid. The shape of the building is formed from an elliptical ‘torus’. This profile allows the use of repetitive components and is structurally efficient resulting in the minimal use of steel section sizes, and lightweight low impact materials.